The new 2017 ATOM Diamond Wave by Easy Motion – a great urban e-bike featuring a smooth and quiet assist with amazing range from the hidden high performance battery. The new 2017 ATOM Diamond Wave by Easy Motion is a great urban e-bike. Beyond its distinguished look, you will also love the smooth and quiet assist and the amazing range of the hidden high performance battery. Propelled by the made in Germany Bröse 250 Watt mid-drive motor, it offers incredible torque performance, giving you the acceleration needed to blend in traffic or climb steep hills. The motor is powered by a high capacity 36 volts 500Wh Samsung lithium-ion battery, fully integrated to the frame and rechargeable on or off the bike. The Bröse motor and Samsung battery being in the middle of the frame makes it a perfectly balanced e-bike. The ride will feel like you’re on a traditional bike and the motor is perfectly weatherproof. Featuring 4 levels of assist and a no assist mode, you can easily select the one that feels just right for you. Let the Bröse 250 Watt mid-drive motor engage at your command for an amazing pedal assist experience, or ride it through 100% human power without extra resistance. To add to your riding experience, the step thru frame and quick adjust 2 way handlebar system allow you to change position to be more or less upright within seconds with no tools, and get on and off the bicycle easily and comfortably. 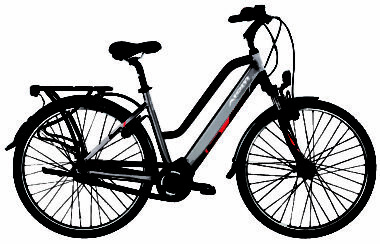 Designed with quality, comfort and safety in mind… the Atom Diamond Wave is available from Kelowna E Ride. See us in store today for full details!